Preschoolers love to play games. Take a few sheets of scrap paper and a crayon, and turn a game of chance into their first lesson in handwriting. This activity is also very effective for older children with motor or sensory processing issues that need the extra practice on grasp, pencil control, bilateral hand use, ocular mobility, and visual-perceptual skills. Really, it addresses all those areas of ability! Making a top-to-bottom defined line is the beginning of your child’s handwriting journey. Pairing it with the standard visual orientation for reading and writing English, letter recognition, and finger control makes this game so much more than just keeping score. A straight edge, such as a ruler. Gray crayon for the adult, and color crayons for each child. Some children like to have lots of choices. Fun game of luck with fast win-lose cycles. I love Crocodile Dentist, but you can make your own game. Try using limited pairs of Zingo pieces to make a “go fish” type game, perhaps. For the youngest players who do not yet know how to write the letters in their name, make a horizontal line across the paper 3 inches from the top. 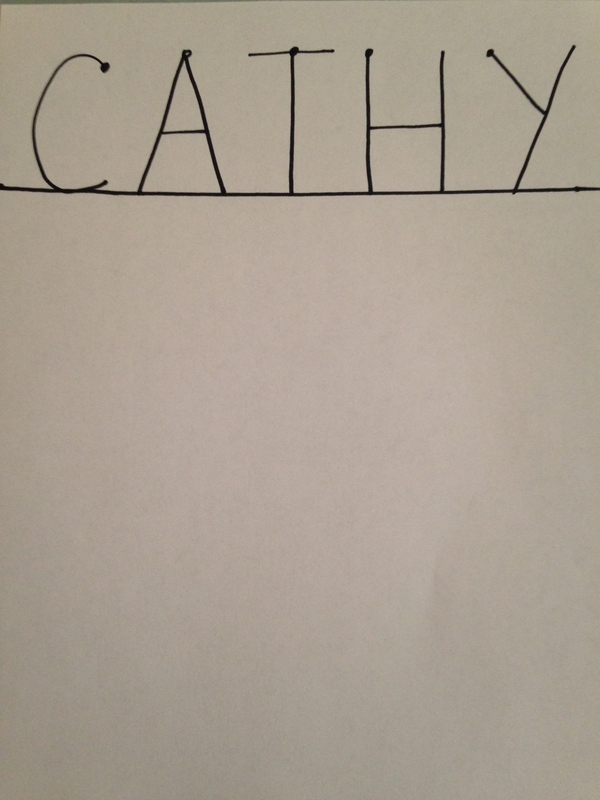 With your gray crayon, write their name in capital letters on their paper, using slightly larger spacing. Make a small dot at the point where you start each letter. Hint: all capital letters start at the top! If your child has a very long name, you will want to tape two sheets together. Using smaller letters or closer spacing is not advisable. On your paper, write your name in a bold color while your child watches you writing. Now ask your child to trace their name on their paper. Tracing rather than connecting dots allows preschoolers to learn the gestalt of letter formation, not jumping from one point to another, and is quickly removed as they progress to full recall. If your child is not writing and has no experience of tracing letters, you may have to make 2 sheets with their name, and trace it with them at the same time that they are working so that they see how you start and sequence each letter. This is also appropriate for children with motor planning issues and children with ASD that need repetition in their instruction. 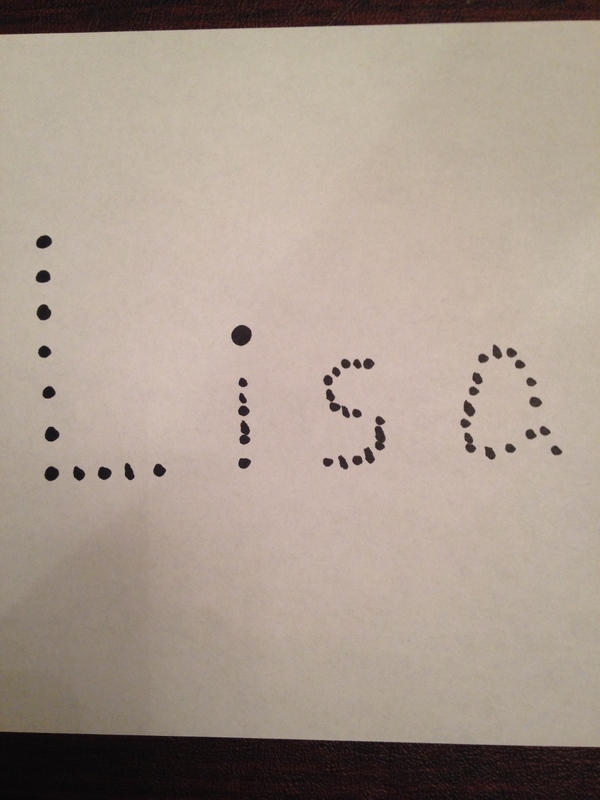 For children in the later part of kindergarten, you can make the line only 2 inches from the top and make only the starting dots for each letter (no tracing). Bold the baseline to remind them that letters “bump” that line. For advanced kindergarteners, switch to the “title case” so that the first letter of a name is a capital, and the remaining letters are lowercase. You may add a single line at the height of a lowercase “o” as a guide for proportion. You do not need an upper line; the top of the paper is your upper line. Each time a game cycle results in a winner, that player will pick up their crayon, place the tip on the horizontal baseline, and make a vertical line down to the bottom of the page. Stabilizing the paper with the non-writing hand is harder when it is oriented this way, and that is desirable. Awareness that handwriting is really a two-handed skill should come early and be automatic by the time your child sits down to write in kindergarten. When the last game is played, count the lines to determine today’s overall winner. This entry was posted in autism, handwriting, occupational therapy, parenting, preschoolers, sensory processing issues and tagged Handwriting games, preschool handwriting on May 23, 2015 by Tranquil Babies.